Here in Massachusetts they celebrate 'Patriot's Day'. This was confusing for me when I moved to the Boston area. I hadn't experienced a state-wide holiday, but there it was; banks were closed, schools were off and the library wasn't even open on this particular Monday in April. I soon discovered that the Boston Marathon did take place on this day, so things were making some sense, but a state-wide holiday?!?!? I had experienced marathons, when I lived on the upper West side and I was able to saunter over to Central Park and watch the non-elite runners finish the New York Marathon. I was always emotional watching these runners cross the finish line after running through the five boroughs. My first year in the Boston area I lived in Newton and basically stumbled upon the Boston marathon. I had put my girls in their stroller and headed toward the noise, not knowing I was going to a pinnacle point of the marathon, Heartbreak Hill. So once again I was witness to runners reaching deep at a very demanding part of the race, and again I was moved to tears by this raw expression of personal determination. Now the Boston Marathon is a more integral part of my life, although not to the extent of most Bostonians. Again I am fortunate to live in one of the towns of which the race traverses; in fact I am again within walking distance of the course. Every year I try to join the festivities, I enjoy watching the pageantry and to be immersed in the energy of the event, but most of all I go to see and cheer on the runners. I am always moved by the heart and spirit of each participant and in awe of their courage. So when I was invited to contribute to the Attleboro Arts Museum's upcoming exhibit, "A Long-Distance Relationship, The 26.2 Mile Journey", I didn't hesitate to participate and to celebrate this Boston event. With so many interesting and provocative themes, I had a hard time deciding but settled on, "Women join the Marathon" (if felt appropriate), and I began my brainstorming procedure - sketching ideas, surfing the internet and reading books. I have become obsessed with the subject and I have been shocked by what I learned about women and the Boston marathon, women and marathons in general and women in long distance running! 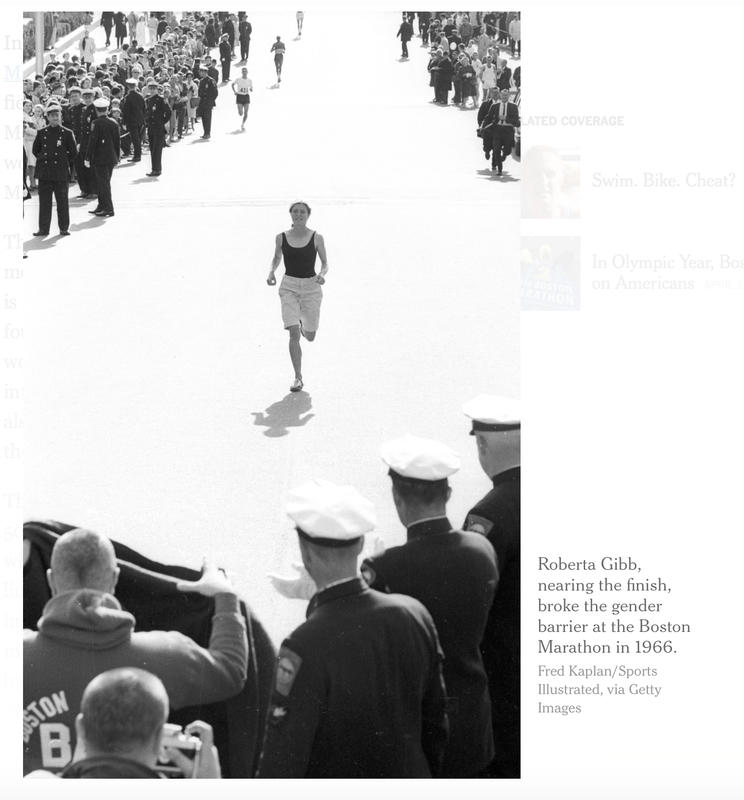 When Bobbi Gibb was the first woman to run the Boston Marathon in 1966, women were not officially allowed to run anything longer than 800 meters. yes you read that correctly! And the BAA (Boston Athletic Association) did not officially sanction a women's division of the Boston Marathon until 1972!! The subject of women joining the marathon reflects on much more then women in running, it casts its shadow on many issues and battles that women are still contesting today. This exhibit and project has lead me to so many interesting books and so much information I need to assimilate that I plan to use this blog as a sounding board of sorts. 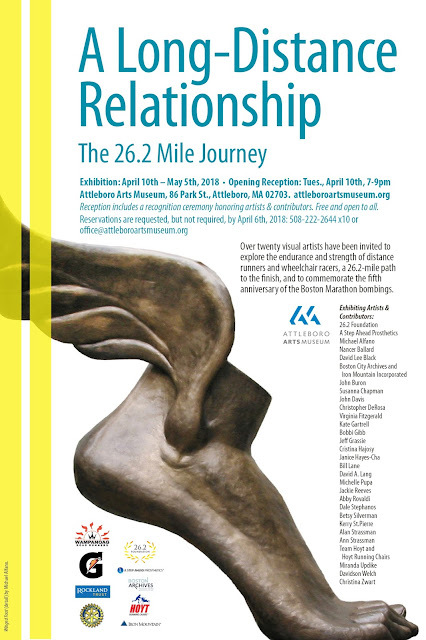 Over twenty visual artists have been invited to explore the endurance and strength of distance runners andwheelchair racers, a 26.2-mile path to the finish, and to commemorate the fifth anniversary of the Boston Marathon bombings.Artistic expressions in oil, watercolor, wood, paper and other mediums will be on view.A Long-Distance Relationship: The 26.2 Mile Journey opens on April 10th, 2018 just days before the running of the 122ndBoston Marathon. As I love to join in creative challenges I have jumped onto HomSweetHom's wagon of weekly #HOMwork challenge, where each week we get an assignment to play with. Now I signed up before I knew that I had to move in about a month, so I told myself that I would join in on the challenges once the dust had settled from my move ... HA! Your assignment this week is to determine who your biggest hero is and why, then letter their name along with some of the reasons you look up to them. This person could be someone who has made you feel like you can go after your dreams and achieve them, someone who has encouraged you along the way, or someone who has been an example to you of who and what you want to be. This person could be a mentor, a teacher, a friend, a family member, someone from a different era, or someone you've never even met. the minute I read the assignment I knew who I would celebrate, but I put it aside because I was moving! I had also side-lined my annual postings for National Women's History Month because of moving! But when we here in Boston got a snow day yesterday and it was International Women's Day and I really do not!! 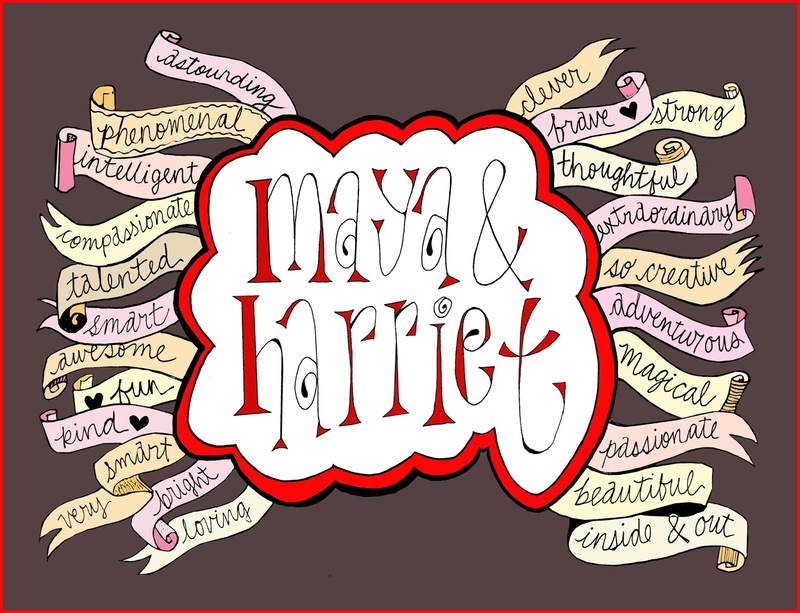 like this whole moving thing, I decided I would treat myself by doing my week 7 assignment ... hand-letter my two heroes and just some of the reasons that these two women rock my world.